Ask a girl about her dream wedding and for sure there will be a lot of beautiful and inspiring answers. You will hear a lot of ideas, plans, and wishlist that I'm sure is something to look forward to when the big day comes. Planning for your dream wedding is not easy. It takes time. Yes, time is of the essence because once your boy friend puts a ring on your finger then the planning stage comes next.It's not today you got engaged then tomorrow you'll be walking down the aisle in your magazine cover perfect wedding gown. Established in April 2014, Bridestory is a leading online wedding vendor which has a strong social media presence among Indonesian and international audiences. Their main focus is to build an advanced wedding platform that connects engaged couples with wedding vendors around the world. They are currently expanding their market in Southeast Asia and here in the Philippines. When you go to their website, you can see a lot of wedding inspirations. Let Bridsestory do the wedding planning for you. From photography, to dress and attire, hair and makeup, venue, videography, catering, and honeymoon! Name it and they will guide you on what to do. In the photo below you can see the categories, plus these are listed below the categories so that finding a supplier will be easy peasy. 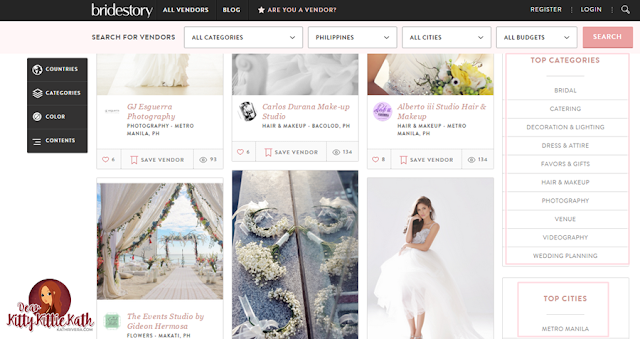 Another great feature of Bridestory is that you can share your beautiful wedding and inspire other brides-to-be in their planning and preparation in the blog section. From their stories, you can get tips on save vs splurge, what and what not, and of course create the once in a lifetime day of your life. I'm planning to have a church wedding three years from now and I'm dreaming of my wedding dress. There are so many attire vendor at Bridestory from different parts of the world. While browsing, my eyes feasted on beautiful, simple yet elegant bridal dresses including the attire of the entourage. I'm in pure bliss while clicking the photos one by one. An hour is not enough to choose the best wedding vendor that fits your personality. Of course choosing a wedding dress is subjective and according to what the bride really wants. 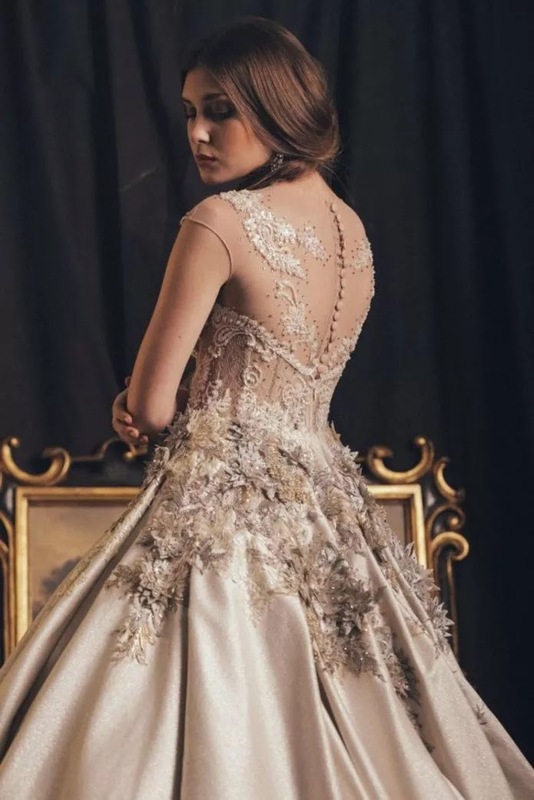 Almost all the wedding dresses I saw on Bridestory are beautifully-made. The photo above is one of the wedding dress that caught my attention. It's simple yet elegant. This is one of the many intricate creations of Ferina Tan. This wedding dress is from Ferina Tan Spring Couture 2015 Collection. The estimated prices of her creations are posted on her page. There's a little profile about the wedding dress vendor too and you can see how many people have like the end product of this vendor. Bridestory is an online wedding vendor that caters to all your wedding needs. Browsing in their website is very easy and aside from the vendors, there are also articles that share relationship tips. So it's also important to reflect on this kind of articles once in a while. 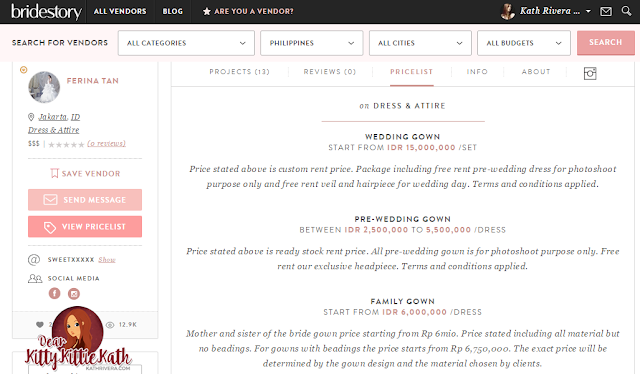 The categories on Bridestory makes browsing a breeze. You can check and concentrate on one category then shift to another easily. Sign up an account with Bridestory and optimize your browsing experience once you fill up the wedding details tab. There's a wedding submission blog if you want to share your beautiful wedding and inspire others too. Once you browse their site, expect it to be non-stop especially if your a bride. You'll be in pure bliss. I'm saying this because even if I'm not yet planning my dream wedding yet, I keep on clicking and clicking and clicking one wedding dress or a wedding invitation time after time.